Powers #2543, 1/4 inch diameter X 1-1/2 inch long Nylon Nailin®. 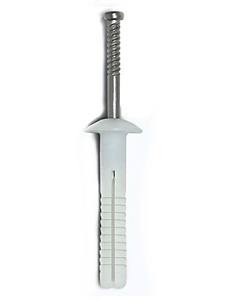 A nylon body drive-pin type anchor with a mushroom head body & carbon steel pin/nail. Price/100. The Nylon Nailin is a pin drive anchor with a body formed from engineered plastic. Nails available in 1018 carbon and 304 stainless steel. The anchor can be used in concrete, block, brick, or stone. The anchor is pre-assembled. This anchor is not recommended for applications overhead. For overhead applications, please refer to the Zamac Hammer-Screw. Available in Mushroom, Round and Flat Types. A sizes from 3/4 to 6 inches.